Is it possible to create a drop down menu with URL in jotform? In my website (using Jotform) I want to add a dropdown menu with URL… like when a visitor will open this home page and select the dropdown menu then he/she will able to go some other page (with different URL). Is it possible? I have already used conditional formatting of jotform. Is it possible to add a search option in this jotform website? ## I have tried to do it in my another form but after doing that your automated system blocked my account. Thanks in advance and good wishes for your excellent team support. Yes, it's possible by changing the URL of the Thank you page with conditional logic. Please note that I've moved this question to another thread, since we're allowed to answer only one question per thread. Thanks for your reply. This is exactly what I want to do. It’s a great job but unfortunately I cannot understand the process how you have done this. Please show me the total process by a demo video. I shall be very grateful to you if you kindly explain it by a video. Please it is my request. Please accept my apologies for not providing you with more detailed steps to create the menu. You can find below more detailed steps to create the menu. 1. You need to set the conditional logic for the dropdown. 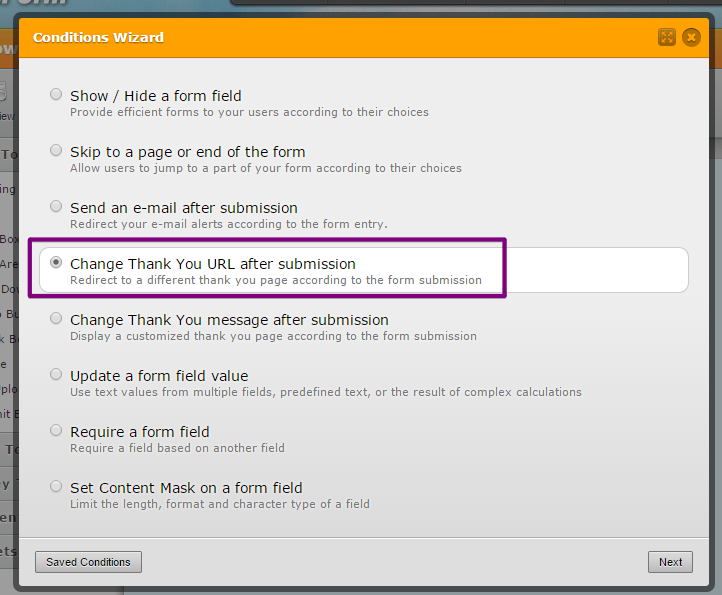 In order to do this you need to go the Setup & Embed and click on the Conditions icon on the top menu of the form editor screen. 2. 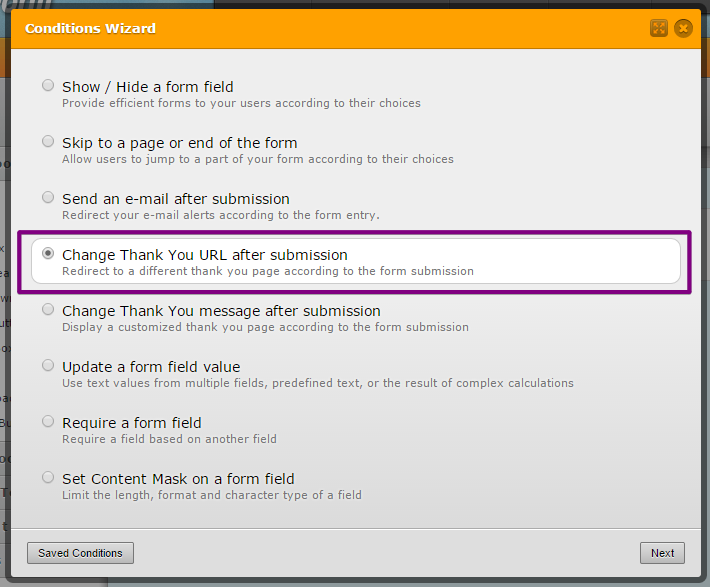 Select the Change Thank You URL after submission option on the wizard and click Next. 3. Create one condition per option in your dropdown. For example, since the dropdown of the demo form had 3 options then I created 3 conditions. Feel free to also clone the demo form if you want to have a deeper look into it.